The Longines Global Champions Tour of Monaco once again played host to the Longines Pro Am Cup on Friday evening, which sees an amateur and professional rider pair up to compete for the coveted title with a focus on speed and agility. The competition, which is in its eighth year, was launched by Patron Charlotte Casiraghi in 2010, emphasises the family spirit of the sport and its pace and relay format make it a real crowd pleaser. Set over two rounds, 13 teams took part - including reigning champions Team Sapinda, as well as Team House of Sillage, Team Monte-Carlo Polo Team and Team Virtus - all battling to jump clear and with the fastest combined time. Fastest in the first round was Team Audi, featuring Dietlinde Thomel and Constant Van Paesschen - the duo flying around on their horses Roberto de Siju and Easy Day d’Hof Ten Bos much to the delight of the cheering spectators. And as the evening lights of Monte Carlo began to twinkle, the eight qualifying teams continued to battle it out for a podium finish as the crowd clapped and cheered the athletes on. Mona Ferry and Christian Rhomberg of Team Federation Equestre de la Principaute de Monaco threw down the gauntlet after Rhomberg set off at a cracking pace to set a combined time of 61.50s. A smiling Christian spoke after his blistering round: “It’s fun! I’m lucky I have a fast mare which makes even a slow rider like me fast! My teammate did a really good job. I just tried to make her go faster in the second round, but we have a few problems with our language - I don’t speak French!" Florence Schwizer-Seydoux and Roger-Yves Bost of Team Equitheme put in a valiant try but stopped the clock just behind, finishing in 61.90s. Team Longines’ husband and wife combination of Ignace Philips and Jane Richard Philips also gave it their all, but couldn’t better Team Equestre de la Principaute de Monaco’s time, slipping in behind in 68.20s. All eyes turned to Team Audi, the team who had been so impressive in the first round. But an early pole for amateur rider Dietlinde Thomel ruled them out of contention, leaving pro rider Constant Van Paesschen unable to do any more. 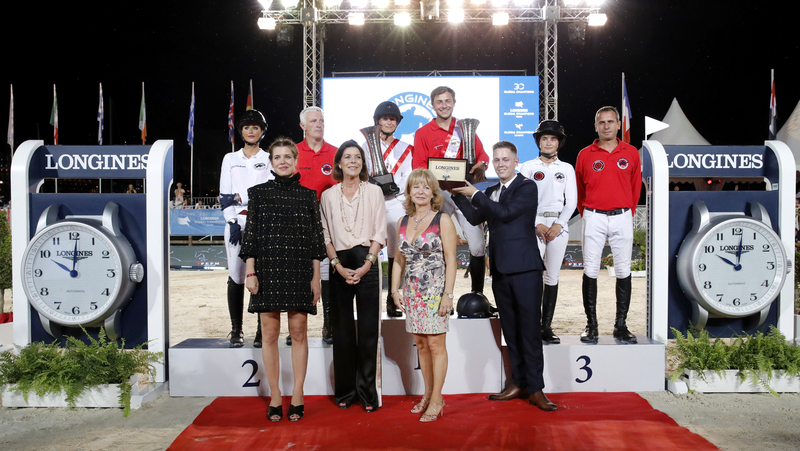 So the win would go to Mona Ferry and Christian Rhomberg of Team Federation Equestre de la Principaute de Monaco, second to Florence Schwizer-Seydoux and Roger-Yves Bost of Team Equitheme, and third to Team Monaco Aces featuring Jeanne Sadran and Julian Epaillard.